Have you ever been told to “Pray to God to keep you and your loved ones safe, but remember to lock your doors”? Locking one’s doors is a wise thing to do in today’s world. It is quite different from choosing war, however. For many years now our leaders have been waging a war against terror and dragging us along for the ride whether you, I or the majority agree with it or not. Being a very spiritual person, I prefer peace rather than war of any kind. That to which we give our focus and attention expands. How is the war on drugs doing so far; or the war against cancer? War will always exist so that we can also know peace. Einstein’s discovery of the Law of Relativity helps us understand that peace is so much more precious relative to war. Just ask any wounded vet or loved ones of those lost in times of war; or innocent women and children in foreign countries whose lives are shaken or damaged by occupying troops. “War never brings peace” is something I’ve heard a couple times in the past week. Where there is a will for a peaceful solution, there is a way. The point of this post is to help you explore what makes you feel safe and peaceful inside. Especially in these turbulent and challenging times when it may seem as if you have no control. 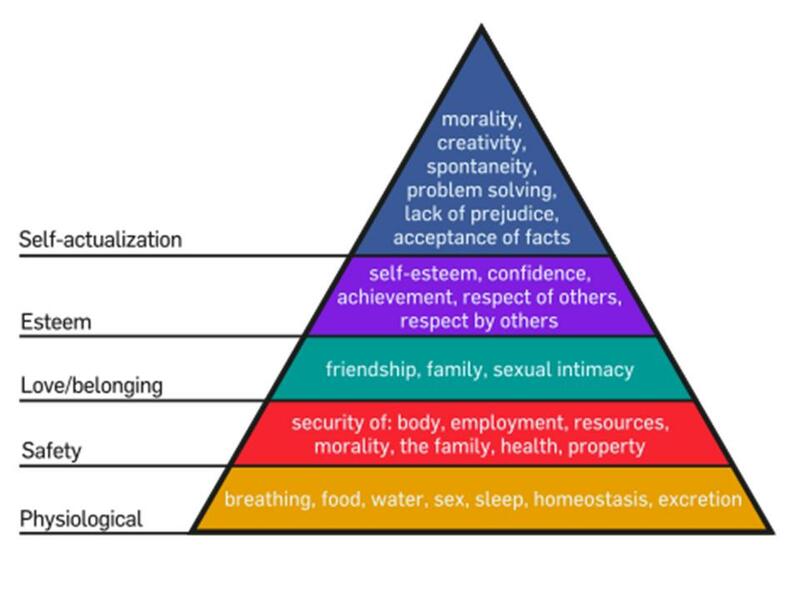 Abraham Maslow created a Hierarchy of Needs which applies to every human being. When the majority of citizens reside at the bottom of the needs chart vying for survival, they may not be aware of nor do they really care about much else. Meaning, they would most likely not take action to effect change for something other than their immediate survival. Individuals must be inspired from the inside or motivated from the outside. Inspiration trumps motivation every time since motivation often just applies to a short-term goal. Inspiration combined with motivation can create miracles. If you’ve ever read the Cherokee Legend of Two Wolves, you are familiar with a story of human choices. I liken these emotional options to unconscious survival programs which get triggered as reactions to what is going on around you. If something happens that makes you feel unsafe or wounded in some way, one of those emotions kicks in and runs you and your choices unless you become the Observer of your life and consciously direct your thoughts and your focus. If you get stuck in one of those emotions it could run for years or lifetimes unless you heal it. You can’t just take a drug or some chocolate and expect that it won’t show up again. You (and everyone) must heal, forgive, or whatever is needed to change negative patterns. If you don’t heal the issue, it will unconsciously run you, your choices and potentially your life. This is true for you, me, our elected officials and everyone in every country. I’ve been challenging my personal beliefs about money this week to get to the bottom of lack of flow. I always thought that I equated money with freedom. When I dug a little deeper I found that I also (or perhaps just recently) equated money with safety. Once I did an energy modality and belief transformation work to heal that negative association, I received a very freeing internal FEELING of safety. Being very experienced with the art of personal transformation, I know that a very well-worn neuropathway in me and collective belief outside of me exist that money brings safety. So I will need to be diligent to strengthen the feeling of safety I received on the inside rather than rely on anything outside of me to reinforce it. Research shows that it takes about 29 days to change a habit. Feeling safe is a basic human challenge from the moment we are born. Remembering who we are and that we are One with the Creator who sent us is a fundamental piece toward achieving an internal feeling of safety. This feeling of safety is what helps us ‘let go and let God’ during challenging times in our lives. You may still need to take action after the letting go process. Follow your own intuition. Is there anything you choose to do or change to help you FEEL safe in stressful times? There is always a peaceful solution to conflict of any kind. Where there is a will, there is a way. Are you willing? Enjoy infinite blessings and peace. Categories: Coaching, Empowerment, Peace, Spiritual | Tags: Behavior Modification, Emotions, feeling safe, habits, Maslow, Peace, Two Wolves, War | Permalink. Said differently, everything comes down to a choice between fear and Love. If you fear something happening more than you love something else happening, the stronger energy has the greater pull on your attention. Heal the underlying issues that create the fear (or other negative emotions) and you will have an easier time focusing on that which you love and moving toward it. Categories: Empowerment, Faith, Peace, Spiritual | Tags: Faith, Focus, Spirituality, Two Wolves | Permalink.